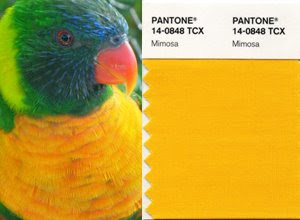 Pantone, a global authority on color, recently announced PANTONE® 14-0848 Mimosa, a warm, engaging yellow, as the color of the year for 2009. According to Pantone, "In a time of economic uncertainty and political change, optimism is paramount and no other color expresses hope and reassurance more than yellow." Given the state of the economy, that's a heavy load for one little color to carry! However, had I been forward-thinking while visiting Lion Country Safari in Florida last month, I would have taken many more photos of this engaging Lorikeet, whose body is nearly a perfect mimosa color! I happen to be wearing Mimosa right now (the color...not the drink! ).